Explore Alcatraz and take a city Segway tour to see top San Francisco attractions such as the Golden Gate Bridge, Coit Tower, and Fisherman’s Wharf on this fascinating and fun combo tour. Relax on your scenic ferry ride along San Francisco Bay to Alcatraz Island and learn the history of the notorious former prison during a comprehensive audio tour. 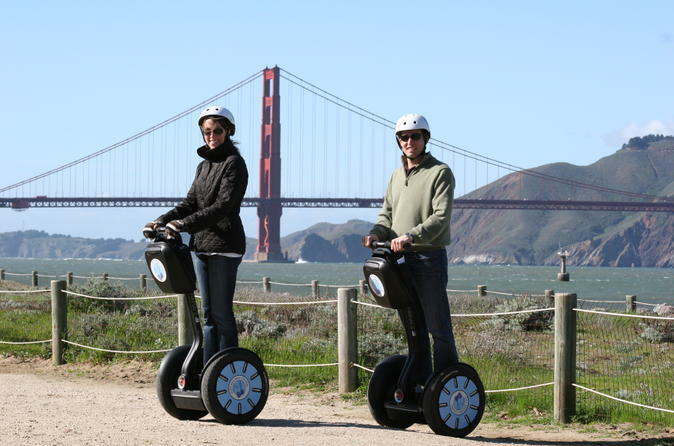 The following day, venture onto the streets of San Francisco on a small-group morning, afternoon or sunset Segway tour for an intimate sightseeing experience. On your first day, board a ferry at Pier 33 for the 10-minute ride across placid San Francisco Bay toward Alcatraz Island. When you arrive, watch an informative movie about Alcatraz, which once housed some of the nation’s most heinous criminals, including Al Capone and James ‘Whitey’ Bulger. A number of inmates tried to escape the massively fortified island, but no one is known to have succeeded. Take an audio tour of the cellblocks and historic buildings that are a gloomy contrast to the spellbinding views of San Francisco’s skyline in the distance. Your Segway tour isn’t until the next day, so there’s no need to hurry. Explore the compound at your own pace and head back to the mainland when you wish; ferries depart roughly every half hour. The day after your expedition to Alcatraz, meet your guide for your 3-hour morning, afternoon or sunset Segway tour -- an intimate, leisurely way to see more of San Francisco than you would on a walking tour or bus tour. Receive a safety orientation to get comfortable on your Segway, and then set off to explore the city with your small group and knowledgeable guide. Listen to your guide talk about the city’s rich history as you glide past its most distinctive landmarks, stopping for incredible photo opportunities. On the morning or afternoon Segway tour, cruise past bustling Fisherman’s Wharf and take in vistas of the Golden Gate Bridge’s regal red towers and Alcatraz’s imposing outline. See the shops and restaurants of Ghirardelli Square and historic marine vessels at Hyde Street Pier and Aquatic Park. Admire a famous San Francisco cable car, and end your adventure with seeing the Palace of Fine Arts and roaming through the Marina district. The sunset Segway tour also includes amazing views of Fisherman’s Wharf, the Golden Gate Bridge, Alcatraz and the Transamerica Building before traveling along the waterfront Embarcadero with its numerous piers. Finish your tour with views of San Francisco’s best-known towers – Washington Square Park and sleek Coit Tower atop Telegraph Hill – before heading back.